When a tree falls in a forest, regardless of whether anyone hears it, it sometimes becomes clam food. Wood that finds its way from rivers into the ocean can eventually become waterlogged and sink to the sea floor, sometimes to great depths. There, tiny clams bore into the wood, eating the wood shavings and living the rest of their lives head down in the holes they made. 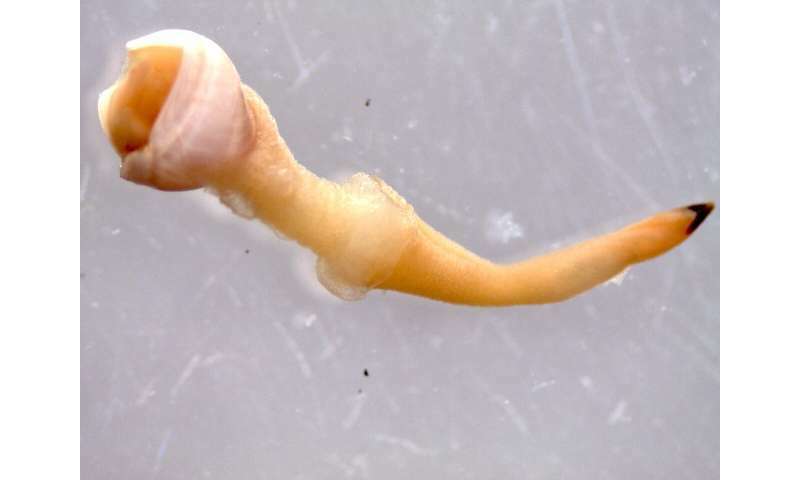 In a new paper in the Journal of Molluscan Studies, researchers have updated the deep-sea wood-boring clam family tree with three new genus groups and one new species. And, it turns out, once removed from their boreholes, the clams are pretty PG-13-looking. All clams are aquatic animals with two shells covering a soft, squishy body. 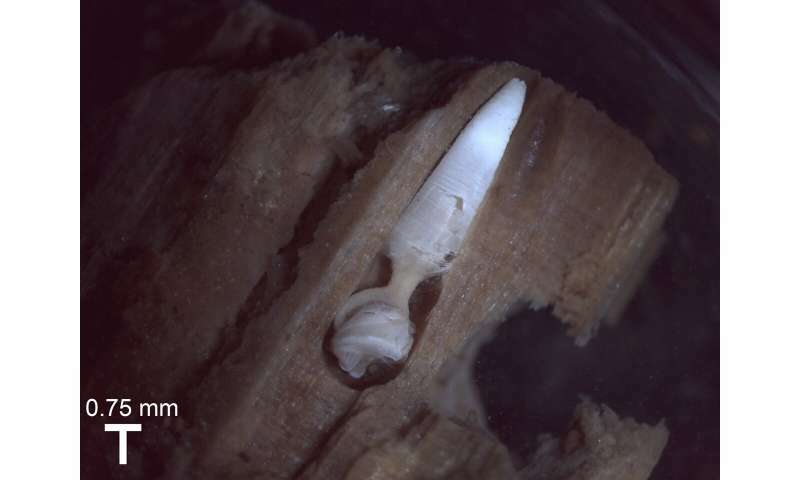 Wood-boring clams have a special something, though—since they bury themselves deep in sunken pieces of wood, they have long, tube-like organs called siphons that extend out from their shells into the ocean water, so they can pull in water and extract oxygen from it with their gills. But while these organs might elicit a chuckle, the clams' diets are what make them really unique. They're able to flex their muscles and rock their shells against the wood, scraping off little bits. The clams then eat this sawdust and digest it with help from special bacteria in their gills. Along with termites and shipworms, they're some of the only animals on Earth that can eat wood. And, as the new study revealed, there are a lot more fundamentally different kinds of them than originally thought. "There's not just one tree-cleaner-upper in the ocean, they're really diverse," says Janet Voight, Associate Curator of Invertebrate Zoology at the Field Museum and the study's lead author. "Imagine living at the bottom of the ocean as a tiny swimming clam; you either have to find a sunken piece of wood or die. You wouldn't think there'd be that many kinds of clams doing this. But we've now found that there are six different groups, called genera, and around sixty different species." When a new organism, whether it's a clam or a frog or a tree, is discovered by scientists, they classify it with a name that tells where it belongs in its family tree. Just like we can give more and more specific locations by going from continent to country to state to city to street, scientists place animals into increasingly specific categories of order, family, genus, and species. In this paper, Voight and her colleagues examined a wide variety of members of the deep-sea wood-eating clam family. By looking at the clams themselves and studying their DNA, the researchers determined that there are at least six different genera (plural of "genus") that make up the family. 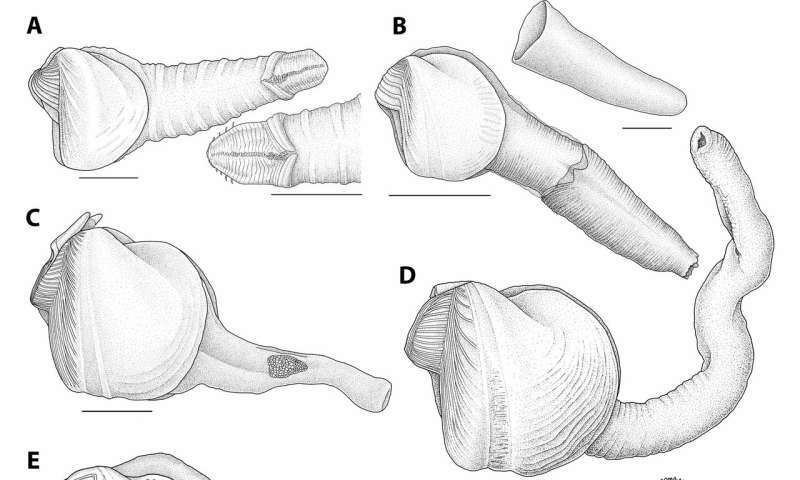 Three of these genera are described for the first time in this paper. The researchers also determined that there was one previously undiscovered species lurking in museum collections of these clams. The importance of the physical differences between the groups aren't immediately apparent. To help confirm the grouping suggested by the animals' physical characteristics, the researchers ran a DNA analysis of the specimens. "You think, am I seeing everything that's there, are there cryptic species, am I over-splitting them and going crazy? It's really scary checking yourself against the DNA, but the results matching what I found gave me a lot of confidence," says Voight. The new genera are named Abditoconus ("hidden cone," a reference to how hard it was to find the cones that cover the clams' siphons within the wood), Spiniapex ("spiny tip," for the barb at the tip of the clam's siphon), and Feaya, in honor of the Feay family, who supported Voight's scientific research at the Field Museum. The new species, gilsonorum, is a reference to the Gilsons, who have invented scientific tools and supported the museum's efforts. While the clams are tiny (some have shells smaller than a pea even as adults), they can settle in massive numbers, making the clams an important factor in the health of their deep-sea ecosystems. "We have no idea how much wood is at the bottom of the ocean, but there's probably a lot more than we think," says Voight. "After big storms, we estimate that millions of tons of wood are washed out to sea. What if these clams weren't there to help eat it? Think how long it would take the wood to rot. The clams contribute to the cycling of carbon, they play an integral part in making the wood into something that the other animals at the bottom of the ocean can get energy from. It could even affect sea level rise. It blows me away."